Yeah. I got laid off on June 13. Not much to say about that, except I understand industry-wise why it happened, it totally sucked, and there might be a nice silver lining in that I was planning to get a freelancing career started anyway so this could be the kick in the pants I need to do it sooner rather than later. Another possible silver lining? I've been thinking about learning how to bake bread for several years now, and even got an excellent cookbook/explanatory book about it a few years ago for Christmas that I haven't used as much as I'd hoped. So with time on my hands, a good instruction manual, a lot of fear and a vanishingly small amount of pastry self-confidence, I may move forward with this project soon. Never fear, I'll keep you posted if I do. Today, though, I cooked what may be the cheapest fully realized dinner of my life (assuming meals of ramen and reheated chicken wings aren't a fully realized dinner, that is). It started when I went to Atkinsons' in Bellevue, which has quite the section devoted to those whose appetites are of the Hispanic persuasion. 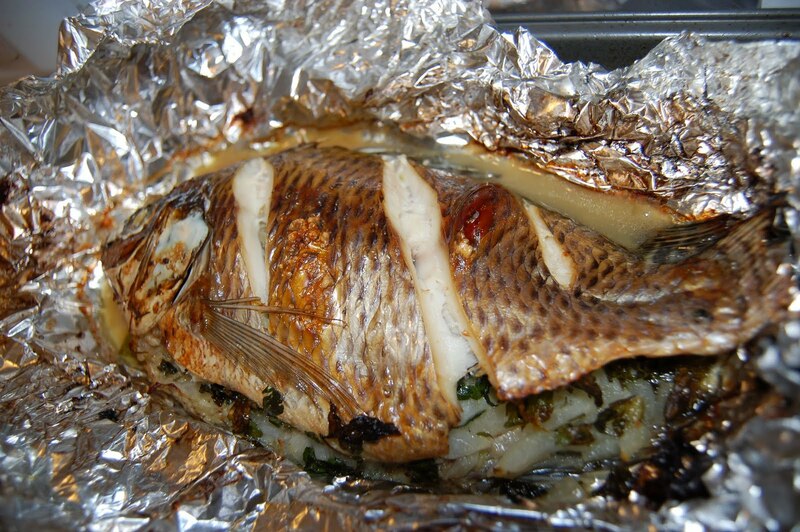 Whole (cleaned, scaled) tilapia were on sale. I bought two...for $2.42. Yep, you read that right; I could have bought four and still spent less than a Subway sandwich. How could I resist that, especially after having seen some excellent depictions of the cooking of whole fish on Top Chef and other such shows? 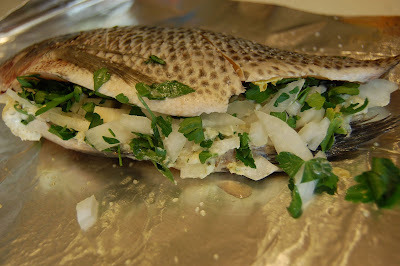 I pulled one out of the freezer two days ago, and have been researching recipes ever since -- although I have a small amount of whole-fish experience that primarily consists of catching, gutting and grilling little lake trout, these tilapia were slightly frightening. 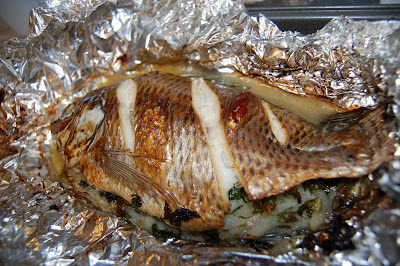 They did have clear eyeballs though, which I've heard is a good indication that the fish is fresh (or freshly frozen). And it didn't smell "fishy" even two days after defrosting (though I did cut the fish open farther than the way it came to me, because the open space wasn't big enough to hold much of the filling I had chosen for this first experiment -- I recommend a sharp fillet knife for this). So this is the recipe I decided to start with. Because if I'm ever in a kitchen without butter, garlic and onions, shoot me. And I'm growing flatleaf parsley out back (it survived the frost that killed my tomatoes and peppers). I made a few substitutions, like the "tuscan-style" herbed butter+olive oil mixture I bought accidentally a few weeks ago, and oh, twice or three times the garlic. I was suspicious the garlic would be too much when I smelled it cooking, but actually the raw Vidalia onions I used were more prominent in the final product's flavor profile than the garlic. And can you really ever have too much garlic? I will say that, for aesthetics, the broiling is pretty important. 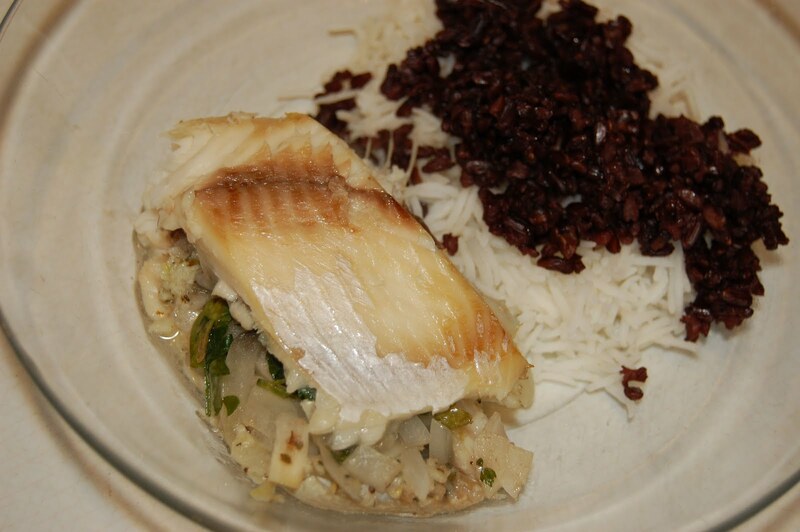 Though the fish was fully cooked when it came out of the 400-degree oven, it still looked like it did when it went in -- broiling gave it the lovely browned bubbliness you expect from some properly cooked fish. ...it was *really* good. 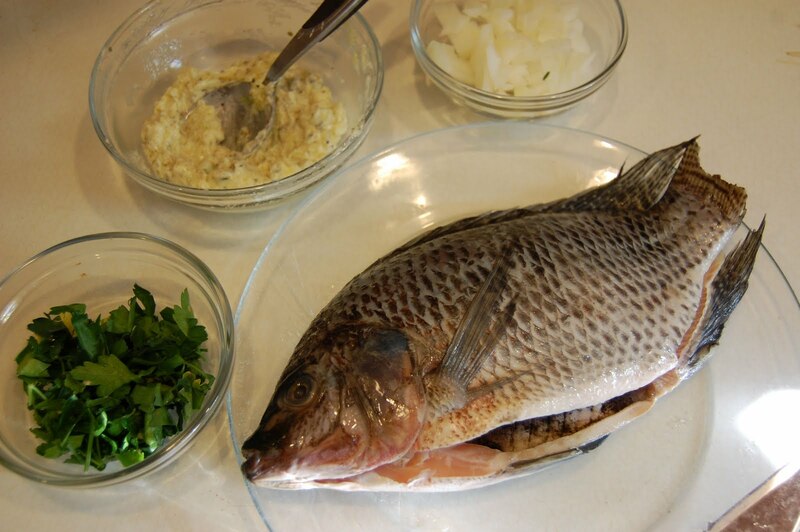 I like tilapia's ability to take on the flavor of whatever you cook it with -- and I'm already plotting what I'll do with the other fish waiting in the freezer -- but seriously? Onion, garlic, butter, lemon and parsley on fish? How could that NOT be good? You do have to watch out for the bones, including both ribs and backbone, but they're pretty big so unless you eat super-fast or unregarding for unsavory bits they shouldn't be a problem. I think there are more $1.21 whole tilapia in my future.